This first appeared in Digital Signage Today on March 29th 2019. Ric Albert, Creative Director at Grand Visual shares 3 ways to bring digital OOH creative to life. OOH continues to outpace other traditional advertising, fuelled by fast growth in DOOH revenue which is expected to continue at a rate of 10% per annum, globally, until 2021. In the UK, digital now accounts for an impressive 50% of total OOH spend, and other markets across Europe and APAC are on a similar trajectory, with the U.S. now also at almost a third. Globally, 2019 is shaping up well for DOOH. Creatively, for me, it is the sheer size, impact, and ubiquity, of digital screens in cities around the world that make it an exciting canvas to work with. Full motion creative is a game changer when it comes to crafting engaging stories for out of home audiences. Study after study has revealed that motion delivers more impressions, for longer, and drives ROI. The effect of good quality creative on the medium itself also enhances the value of that media. However, I was dismayed to learn recently from one of the U.K.’s largest media owners, that just 10% of the creative delivered to their full-motion digital portfolio is animated. I’ve been scratching my head ever since. Can it be budget constraints? Are advertisers overwhelmed by the diversity of formats, locations, and technologies that make up the DOOH landscape? Plus with so much discussion focused on what the medium can do now, and in the near future, as a programmatically enabled, blockchain assisted platform, it is easy to see how some are finding the endless possibilities daunting. So to all those advertisers who are still unsure about how to approach the medium, or are still using DOOH as an extension of their standard print or static outdoor work – here is a back to basics guide for crafting good quality, full motion DOOH creative. Based on three simple fail-safe tips that won’t break the bank. Generate creative that works harder. I’m talking motion. Motion, motion, motion! It attracts the eye, it helps to tell a story, it delivers drama and emotion. It brings a totally new dimension. It delivers cut through. It’s the absolute must-have for visual communication. It seems so obvious and yet we still see so much DOOH advertising that is static. If your formats have it, use it! The power of motion helps an ad come to life. Sometimes, it doesn’t need much — a sprinkle of animation can elevate the creative into something memorable. Take advantage of the video content that may exist. Seek out the TV spot or trailer. It will have shots in it that bring a depth and richness to the DOOH creative. Digital isn’t just pixels instead of paper, it gives us the opportunity to do more. We should be harnessing the potential of DOOH and stop using it as just another delivery file. It’s all about creative impact. And sometimes, a JPEG just isn’t that impactful! We can easily push beyond traditional print with animation, videos, live and updatable content. Be mindful of your environment and duration. All signs point to shorter sharper messaging being the way to go, but depending on the environment and duration of the digital screens you are using and what you’re trying to accomplish — longer form copy can work too. Consider the difference between a five, a ten and a 20-second execution. Are you giving yourself enough time to establish your brand and message? Are you using the full duration of the execution wisely? Are you putting appropriate creative into different environments? Is there the potential to deliver multiple brand messages? DOOH allows us to build a layered and nuanced piece of communication. 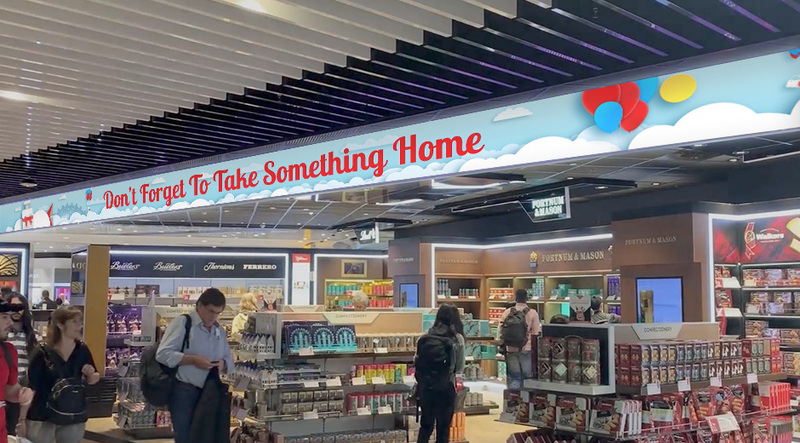 Delivering a complex message or a last-minute offer is something that DOOH is great at. For example, in a ten-second piece, the creative can start with a call to action, proceed to the offer and finish with establishing the brand proposition. Separating these messages into bite-size pieces allows the audience to take in each element without being overloaded. It’s digestible and impactful and works for the dwell time. Intelligent scheduling can make all the difference. Create something for the morning commute and another message for the evening. Or communicate with your weekend audience in a different way from the midweek crowd. Subtle changes in copy can build real depth to your campaign. Digital OOH is a connected media. We are already serving creative that adapts to real-time feeds, such as weather, traffic flow, and social media trends. The infrastructure is in place so it makes sense to get the media working hard with useful and relevant messaging that can change and evolve during the course of a campaign. Now, campaigns can adapt and respond to conditions and real-world events, or feature last minute deals that push different products to different audiences at different times in the day. By harnessing the context effect, brands can achieve cut through and turbocharge the relevance, and effectiveness of their advertising messages. So the challenge is on for 2019 for all of us to ditch the JPEG. To be creative. All of the time. It doesn’t have to eat up your budget, it just has to move. Let’s ditch the JPEG and get the creative working harder. Let’s maximize the potential of the medium, use the full canvas, duration, and be relevant, and contextual. Let’s capitalize on the unique creative opportunity that DOOH provides for brands and audiences alike.